During the ownership of A.C. Bertelli, Aston Martin was a very successful manufacturer of small (cycle-fendered) sports cars in the 1930s. With legendary cars like the Ulster, the manufacturer scored many class wins in the most important races like the 24 Hours of Le Mans. From 1937 the company slowly changed policy by putting more emphasis on road cars. The culmination of these developments was the Atom prototype launched in 1939. It featured a very modern steel spaceframe chassis and an equally modern four door sedan body. 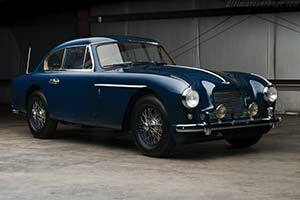 It was after driving the Atom in 1947, that gearbox manufacturer David Brown decided to buy Aston Martin. With the Claude Hill designed Atom chassis, Brown had a strong basis for a new range of models, but he rightfully felt the push-rod engines available to be inadequate. Instead of having a new engine designed, he shopped around some more and bought Lagonda. As part of the deal, Brown obtained the rights to produce the W.O. Bentley designed twin-cam six cylinder engine. Before this deal was done, Aston Martin had already produced a small series of two-litre sports cars based on the Atom design. These were called 2-Litre Sports at the time, but in retrospect are usually referred to as DB1. At the first Post-War 24 Hours of Le Mans in 1949, a six cylinder engined racer debuted that would prove to be the first of a long line of successful Aston Martin road and racing cars. At the New York Auto Show in April of 1950 the production version of the six cylinder car was launched. Dubbed the DB2, it featured a 2.6 litre version of the Lagonda six cylinder engine and sported an attractive two-door coupe body penned by Frank Feeley. The new Aston Martin was an immediate hit and the small factory could hardly cope with the orders. On track there were plenty of successes as well with the Works DB2s scoring first and second in their class at Le Mans in 1950. The win in the Index of Performance was possibly an even better indication of the DB2's excellent design. The first fifty cars off the production line featured very prominent external grilles, which were fortunately removed. A more powerful Vantage model was offered from 1951.